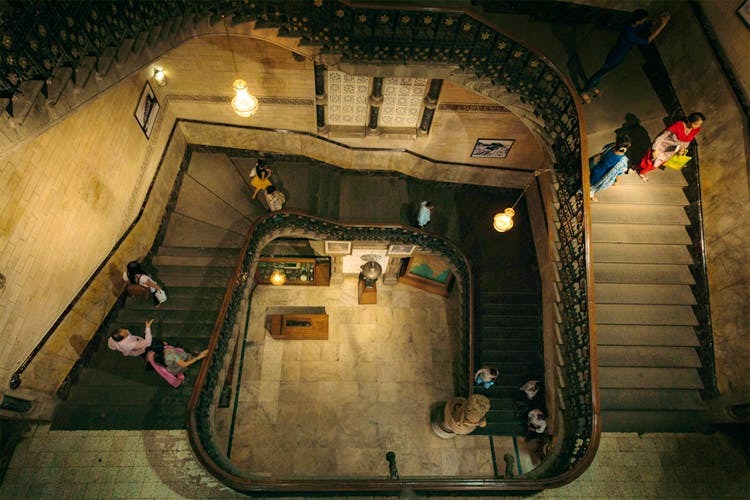 Mumbai is rich in history that neatly blends with its modern avatar without taking away the antique value. While a substantial lot moves to Mumbai for a livelihood, the city also gets a massive influx of tourists on a daily basis. While they do visit all the popular spots in the city, a lot of them are missed out on. We culled out some of our favourite spots that will not only teach you a whole deal about the city, but also make for some breathtaking photos. This majestic structure was conceptualised in 1911 to welcome King George V and Queen Mary. However, they only got to see a cardboard version of the Gateway of India because the construction only started in 1915. Built with a vision to lay an striking first impression, this was the entry point for all prominent Britishers and continues to be an entry point for incoming ferries even today. Built in 1887 to commemorate 50 years of Queen Victoria adopting the Indo-Saracenic architecture, the station supports both the suburban network and central railways, and is a heritage site demarcated by UNESCO. Though one of the busiest stations in terms of passengers, the site also gets frequented by tons of tourists to capture the light play on the face of the building every day. Oh, and there’s a hidden museum inside the station. For more info, click here. An almost two-century-old building, Asiatic Library has Roman-Greek architecture with eight Doric columns in the portico and the famous flight of 30 stairs. We presume this is what makes this building Bollywood’s favourite spot that often doubles up as a court room for all sorts of drama. Remember that tale about Lord Rama and brother Lakshmana were looking for Sita and the entire hunt left them so parched that Lakshmana struck a bow to the ground and a whole lake emerged? Well, that lake, the Varanasi of Mumbai, is situated in the middle of the posh Malabar hills and is a place where religious rituals are a routine. Located in Bandra, Mount Mary Church is Roman Catholic Basilica which must be visited on the first Sunday after September 8 for the grand feast of the Blessed Virgin Mary. But what’s more interesting is the history of this place – a Koli fisherman dreamt that he would find a statue in the sea which is exactly what happened somewhere between 1700-1760. And that’s why both Christians and Kolis visit this church creating a peaceful semblance. Gilbert Hill is possibly older than time itself; we are talking some 66 million years old. Yes, you read that right. This 200-feet-tall monolith is a result of a massive volcanic eruption and the fun part is that there are only two other such structures in the world, both located in USA. The Gilber Hill houses two Hindu temple on the top which also offer a panoramic view of the city’s skyline. Located in the midst of Sanjay Gandhi National Park, Kanheri Caves are a collection of 109 Buddhist caves which dates back to the 1st century BC. It gets its name from the Sanskrit word ‘Krishnagiri’ meaning black mountain as these caves have been carved from the basaltic rock. Now that the monsoon is around the corner, you must pay these caves a visit if you haven’t already.